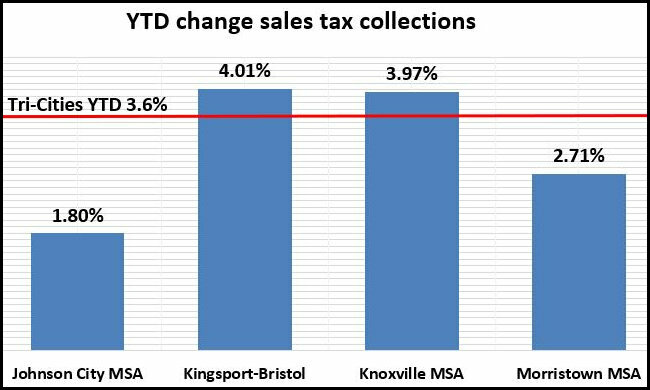 You are here: Home / Home / CORE DATA / Kingsport-Bristol finishes 2018 with best retail sales tax collections performance in NE Tenn.
With the exception of the Morristown Metropolitan Statistical Area (MSA) NE Tenn. metro areas lagged the state performance in December sales tax collections. But that was only part of the story. 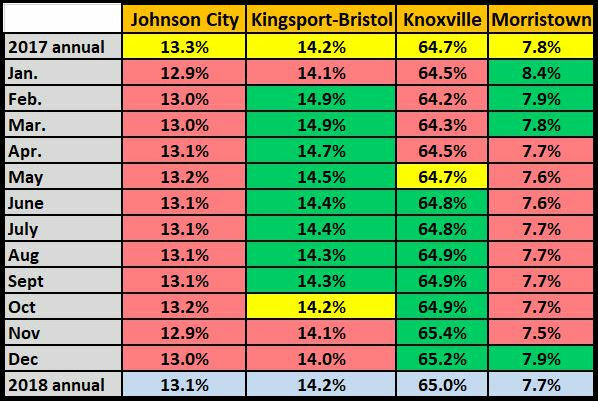 Kingsport-Bristol edged out Knoxville for the best annual year-over-year performance in the region. But a soft third quarter spoiled Kingsport-Bristol’s eight-straight months market share performance bringing 2018’s total to the same place it was in 2017. The situation for the three-county Johnson City MSA was not as good. Its year-over-year collections were up but it trailed the other local metro areas. That brought its annual market share below what it was in 2017. Statewide collections were up 5.5% according to MTSU’s Department of Economic and Finance and the state Advisory Commission on Intergovernmental Relations December report on seasonally adjusted collections. Performance of local metro areas was even worse on the month-over-month metric. Statewide collections were up 0.6%. Annual and monthly NE Tenn. market share of seasonally adjusted sales tax collections.